Dr. Dennis Timko is an experienced specialist who provides diagnosis and treatment of foot and ankle problems, including, common injuries such as sprains and fractures to complex reconstructive foot and ankle surgery. He is also extensively trained to render care of diabetic foot suchas Charcot disease, infections, wound care and ulcers. Dr. Timko makes a point to listen carefully to all his patients and communicates with them in a way which allows them to fully understand their problem. His philosophy is to prevent foot deformities, diagnose and treat the foot and related disorders. A conservative physician, he provides surgical treatment only as a last resort. 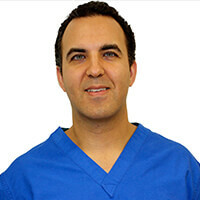 Education/Residency Dr. Timko graduated from Lenoir-Rhyne College in Hickory, North Carolina with a bachelors degree in Biology and received his Doctor of Podiatric Medicine degree from Des Moines University of Osteopathic Medicine. He continued his education completing a three year residency in St. Louis at Forest Park Hospital in reconstructive foot and ankle surgery and limb salvage. This residency was noted as a top 5 residency in the country in Foot and Ankle surgery. Dr. Alan M. Jacobs was the residency director and is one of the best if not the best podiatric physicians in the world. Dr. Timko spent more than 3 years under Dr. Jacobs’ supervision and training and recommends any student or physician try to meet him or listen to him lecture at least once in their lifetime.